Traditional olive oil from Pegalajar (Jaén). Product with a long history, produced generation after generation of farmers from Sierra Mágina. Soft flavour very balanced and golden colour. Without chemical additives, only through mechanical procedures. Use a variety of Picual olive. This oil was obtained from olives that have reached the perfect degree of ripeness, with a dark green, deep purple and black color. The harvest take place during the months of January and February. The result is an ideal oil of great balance in flavor and scent. A soft oil ideal for cooking stews and fried. For its softer flavor, this olive oil can be used to cook more elaborate dishes such as pastry. 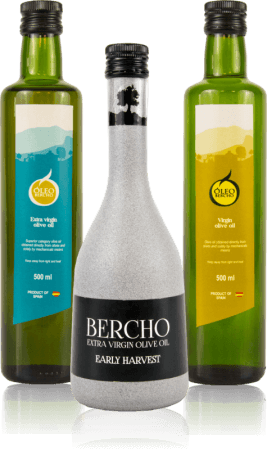 With the Oleobercho´s Virgin Olive Oil can get to cook any dessert providing the right flavour. Futhermore it´s also very suitable for fried foods because the temperature at which it burns is much higher than that of other olive oils, what makes the final result the ideal one.